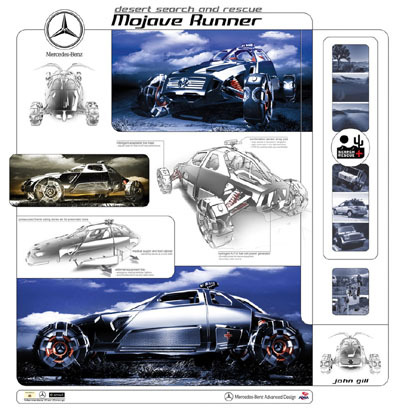 The Mercedes-Benz Mojave Runner concept was one of the entrants into the 2006 Los Angeles Auto show's 'LA Adventure' design competition. A competition in which the participants chose an activity available in the southern California area, and then designed a vehicle for that purpose. 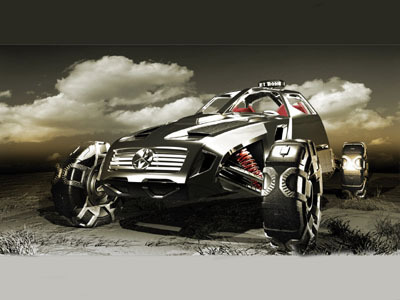 Designed at Mercedes-Benz Advanced Design of North America, the highly advanced Mojave Runner is a gas-electric hybrid dune-buggy designed to survive in extreme weather conditions and inhospitable terrain. Like the Mojave Desert of southern California. 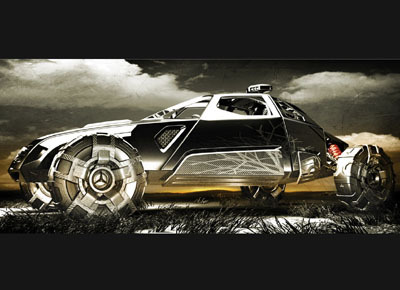 Features of the Mojave Runner include night vision, a sandstorm radar and GPS sensors. Equipped with a hydrogen fuel cell generator, the Mojave Runner is able to provide electrical power for onboard tools and rescue equipment. The strong, lightweight exoskeleton frame is a combination of carbon-fiber and pressurized aluminum tubing that stores air for powering pneumatic power tools. The Mojave Runner also uses intelligent adaptive tires which automatically adjust their tread depth to maximize performance both on and off the road.